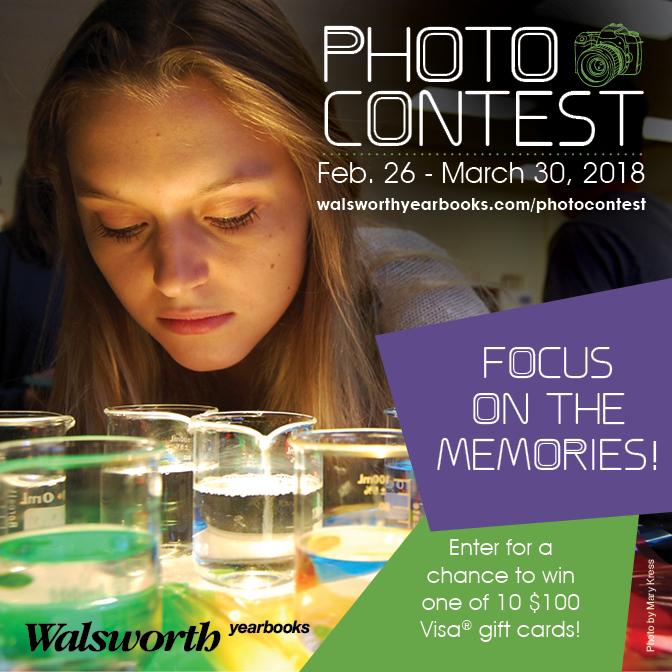 This year’s Walsworth Photo Contest begins on Monday morning. For the next month, yearbook photographers across the country will have their chance to win one of 10 $100 Visa gift cards (and bragging rights, of course). The 2018 Photo Contest will run from Feb. 26 through Friday, March 30. Photographers will compete in 10 categories, with $100 Visa gift cards being awarded to the winners in each one. Entries into this year’s contest can be uploaded at our 2018 Photo Contest page. Junior High/Middle School – We’re looking for the best junior high/middle school photo of any genre. Photo must be taken by a junior high or middle school student. Photo Illustration – Show us a photo that has been modified, manipulated or otherwise features special effects that were created to tell a story. (New!) Sports Reaction – Focus on the fans. Nervous, happy, sad. Show us the moment your fans react to something happening during a sporting event. (New!) Yearbook Life – Show us yearbookers in action. Staffers doing the everyday duties of yearbook life and also inside the classroom — interviews in progress, photographers taking pictures, reporters covering events, advisers teaching and even what’s happening on deadline days! One winner and Honorable Mentions will be chosen in each category. Any student who is chosen a winner or Honorable Mention in more than one category will also be the recipient of a Portfolio award. All entries will be judged by a committee, based on the basic rules of photography, overall quality and creativity/originality. Winners in this year’s contest will be notified by May 1.